Computational modeling indicates that cardiac conduction may involve ephaptic coupling – intercellular communication involving electrochemical signaling across narrow extracellular clefts between cardiomyocytes. 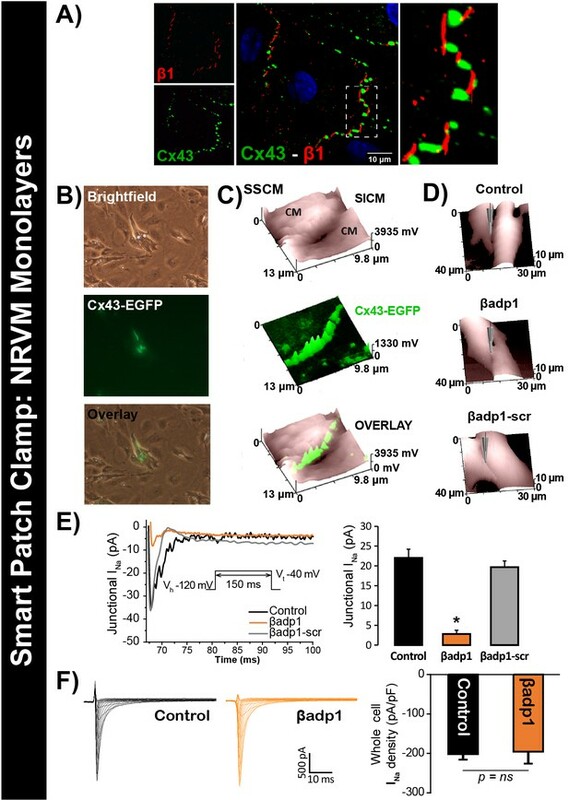 We hypothesized that β1(SCN1B) –mediated adhesion scaffolds trans-activating NaV1.5 (SCN5A) channels within narrow (<30 nm) perinexal clefts adjacent to gap junctions (GJs), facilitating ephaptic coupling. Super-resolution imaging indicated preferential β1 localization at the perinexus, where it co-locates with NaV1.5. Smart patch clamp (SPC) indicated greater sodium current density (INa) at perinexi, relative to non-junctional sites. A novel, rationally designed peptide, βadp1, potently and selectively inhibited β1-mediated adhesion, in electric cell-substrate impedance sensing studies. βadp1 significantly widened perinexi in guinea pig ventricles, and selectively reduced perinexal INa, but not whole cell INa, in myocyte monolayers. In optical mapping studies, βadp1 precipitated arrhythmogenic conduction slowing. In summary, β1-mediated adhesion at the perinexus facilitates action potential propagation between cardiomyocytes, and may represent a novel target for anti-arrhythmic therapies. The concept that the heart beats as a functional syncytium composed of discrete muscle cells electrically coupled by gap junctions (GJs) is a foundational theory of modern cardiology (Kléber and Rudy, 2004). Moreover, as GJ remodeling occurs in multiple cardiac pathologies (Jongsma and Wilders, 2000; Stroemlund et al., 2015), it is widely held that disrupted GJ coupling is mechanistically central to arrhythmogenesis in heart disease (De Vuyst et al., 2011; Palatinus et al., 2012). Whilst a GJ-based paradigm for cardiac electrical coupling has been in place for over 50 years, a small group of mathematical biologists has proposed that cardiac conduction in health and disease may involve ephaptic mechanisms (Lin and Keener, 2010; Mann and Sperelakis, 1979; Mori et al., 2008; Pertsov and Medvinskiĭ, 1979). Ephaptic conduction is conceived as involving the intercellular transmission of action potentials via ion accumulation/depletion transients occurring within narrow extracellular clefts between closely apposed myocytes. Further interest in this hypothesis has been stoked by provocative findings such as conduction still occurring in mice with knockout of the principal ventricular GJ protein, connexin43 (Gja1/Cx43) (Gutstein et al., 2001) and in humans with dominant negative mutations of GJA1, the gene encoding Cx43 (Shibayama et al., 2005). Although the ephaptic hypothesis has remained controversial, owing to a lack of direct experimental evidence, theoretical studies have identified two key elements of a hypothetical structural unit that might support this alternative mechanism of conduction (Mori et al., 2008; Hichri et al., 2018; Kucera et al., 2002; Lin and Keener, 2013): 1) Close proximity (<30 nm) between the membranes of adjacent myocytes and 2) a high density of sodium channels at such points of close inter-membrane apposition. These prerequisites for the formation of a cardiac ephapse pointed to its likely location in the intercalated disk (ID) where cardiac sodium channels are concentrated (Maier et al., 2004; Petitprez et al., 2011). Here, we report that α (Scn5a/NaV1.5) and β (Scn1b/β1) subunits of cardiac sodium channels preferentially localize at the perinexus, a nanodomain at the edge of GJs, (Rhett et al., 2011) where the membranes of apposed cells routinely approach each other closely enough for ephapse formation (Veeraraghavan et al., 2015). Additionally, we demonstrate that adhesion mediated by the extracellular immunoglobulin (Ig) domain of β1 generates close proximity between the membranes of adjacent cells within perinexal nanodomains, likely enabling these to function as ephapses. Importantly, we identify dynamic changes in perinexal ultrastructure, secondary to compromised β1-mediated adhesion, as a novel mechanism for arrhythmogenic conduction defects. In this study, we tested the hypothesis that NaV1.5-rich nanodomains within the ID may enable ephaptic coupling between cardiac myocytes, and that the cell adhesion function of β1 may be important to this phenomenon. We present an array of experimental evidence detailing the nanoscale location, structural properties, and makeup of NaV1.5-rich ID nanodomains and demonstrate that inhibition of β1-mediated adhesion disrupts these nanodomains, with proarrhythmic consequences. The cardiac voltage-gated sodium channel is a trimer comprised of a pore-forming alpha subunit (NaV1.5) and two non-pore-forming β subunits, the latter possessing an extracellular Ig domain, which facilitates adhesive interactions (Namadurai et al., 2015; O'Malley and Isom, 2015). To determine the distribution of the cardiac sodium channel complex we raised, characterized, and rigorously validated rabbit polyclonal antibodies against NaV1.5 and β1. Both antibodies displayed intense immunolabeling of N-cadherin (N-cad) -positive IDs (Figure 1A, Figure 1—figure supplement 1) in laser scanning confocal microscope (LSCM) images of guinea pig (GP) ventricular tissue and single bands at the expected molecular weights in western blots (Figure 1—figure supplement 1; detailed results from validation studies are provided in supplementary material). Also, in dot blot experiments, both antibodies displayed selective affinity for their corresponding epitopes, with no evidence of cross-reactivity to each other’s epitopes (Figure 1—figure supplement 2). ID Localization of NaV1.5 and β1. (A) Representative confocal images of GP left ventricular (LV) sections co-labeled for NaV1.5 (green; top) / β1 (green; bottom) along with N-cad (red). (B) Schematic diagrams, and representative confocal images of N-cad (red), and β1 (green) illustrate the plicate, and interplicate regions of the ID when viewed en face. The cartoon on the right summarizes the essential question addressed using STORM: Where within the ID are NaV1.5 and β1 localized? Representative STORM images showing x-y plane views of en face IDs labeled for: (C) Cx43 (green) and Nav1.5 (red), (D) N-cad (green) and NaV1.5 (red), (E) Cx43 (green) and β1 (red), (F) N-cad (green) and β1 (red). Individual fluorophore molecules localized were at 20 nm lateral resolution, but are represented as 50 nm spheres to enhance visibility in print. The inset in C is shown rotated by 90° along the z-axis, and illustrates a Cx43 cluster flanked on either side by a cluster of NaV1.5. While the observation of ID-enrichment of NaV1.5 (Figure 1A, Figure 1—figure supplement 1A) is consistent with previous studies (Maier et al., 2004; Petitprez et al., 2011), en face views of IDs reconstructed from LSCM optical sections revealed a previously unreported aspect of β1 organization (Figure 1B). In these end-on views of IDs, β1 displayed a lattice-like distribution with specific immunolocalization within N-cad-free interplicate sectors of the ID (Figure 1B, Figure 1—figure supplement 3C). Interplicate regions of the ID are well-characterized as being enriched in Cx43 GJs (Severs, 2000). In line with this, punctate Cx43 immunosignal corresponding to GJ demonstrated close association with the strands comprising the β1 lattice (Figure 1—figure supplement 3B). The LSCM observations were confirmed by super-resolution STochastic Optical Reconstruction Microscopy (STORM) at sub-diffraction resolution (20 nm lateral, 40 nm axial) (Figure 1C–F). 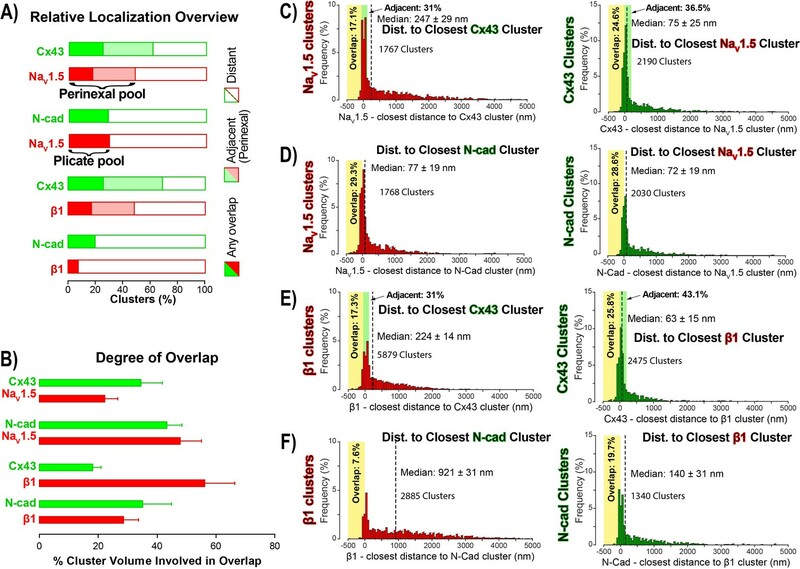 A significant proportion of immunolocalized NaV1.5 molecules were organized into clusters preferentially localized adjacent to clusters of Cx43 molecules (i.e. GJs; Figure 1C), while a population of NaV1.5 molecules was also observed co-distributing with N-cad (Figure 1D). In contrast to NaV1.5, β1 molecules organized into a lattice-like distribution with β1 strands punctuated by tight side-by-side association with Cx43 clusters (Figure 1E), but extending almost exclusively through N-cad-free interplicate zones of the ID (Figure 1F). To quantitatively assess the overlapping, but distinct distributions of β1 and NaV1.5 relative to Cx43 (GJs) and N-cad (plicate zone/adherens junctions) within the ID, we used STORM-based relative localization analysis (STORM-RLA; Figure 2) (Veeraraghavan and Gourdie, 2016). Briefly, relative localization of co-labeled proteins is quantitatively assessed by detection of clusters of localized molecules, and measurement of overlap, and closest distances between clusters. STORM-RLA quantification of NaV1.5 and β1 localization. (A) A graph summarizing STORM-RLA analysis of relative localization between clusters of co-labeled proteins. The solid bars indicate clusters with any overlap, the shaded bars represent adjacent clusters (corresponding to perinexal localization), and the clear bars indicate clusters distant from each other. (B) A summary graph of the degree of overlap, that is the fraction of cluster volume involved in overlap for those clusters, which demonstrated any overlap (corresponding to the filled bars in A). (D–F) Summary histograms generated by STORM-RLA show the closest inter-cluster distances between clusters of co-labeled proteins (n = 3 hearts, four image volumes per heart). The yellow boxes on each plot highlight negative inter-cluster distances, which correspond to overlapping clusters. Dashed black lines mark the median values. The green boxes indicate overlap of NaV1.5/β1 clusters with perinexal regions surrounding Cx43 clusters (extending 200 nm from the GJ/Cx43 cluster edge [Veeraraghavan et al., 2015]). In accordance with visual assessment (Figure 1), STORM-RLA indicated that nearly half of ID-localized NaV1.5 clusters (48.1%) were located adjacent Cx43 GJ (Figure 2A,C), a sub-population we term the perinexal pool. This pool included 31% of NaV1.5 clusters that did not overlap Cx43 clusters, and an additional 17.1% which tangentially overlapped Cx43 clusters (Figure 2A,B,C). A second, plicate pool of NaV1.5, localized to N-cad-rich plicate ID regions, was found to contain 29% of ID-localized NaV1.5 (Figure 2A,B,D), consistent with previous reports from us (Veeraraghavan and Gourdie, 2016) and the Delmar group (Leo-Macias et al., 2016). Closely paralleling the NaV1.5 case, nearly half (48.3%) of ID-localized β1 clusters were also identified within perinexal nanodomains (Figure 2A,E). However, only 7.6% β1 clusters were co-located with N-cad clusters (Figure 2A,F), suggesting that an overwhelming 92.4% of ID-localized β1 clusters are located in N-cad-free, GJ-rich interplicate ID regions. In summary, the pore-forming subunit NaV1.5 is divided between two significant pools within the ID, a perinexal pool, and a plicate pool; however, the β1 subunit is mainly localized in perinexal, and other interplicate ID sites. The extracellular Ig domain of β1 facilitates adhesive interactions, including trans homophillic interaction with β1 molecules on neighboring cells (Calhoun and Isom, 2014). In order to assess this intercellular adhesion function, as well as to create an assay model for identification of β1 adhesion antagonists, we quantified intercellular junctional resistance changes in cells heterologously overexpressing β1 (1610 β1OX) using electric cell-substrate impedance sensing (ECIS). This technique measures the electrical impedance offered by a monolayer of cells to current flow between electrodes located above, and below the monolayer, and previous studies demonstrate that the resistance of the extracellular cleft at cell-cell junctions (junctional resistance) is well-reflected by measurements at low frequencies (62.5–4000 Hz) (Moy et al., 2000; Tiruppathi et al., 1992). Junctional resistance was markedly higher (>3 fold) in 1610 β1OX cells, compared to cells without β1 (1610 Parental; Figure 3A), consistent with the expression of β1 increasing levels of adhesion between the cells. Immunosignals for tight junction proteins and Ca2+-dependent cadherins were below detectable levels, and did not change with β1 expression (data not shown), suggesting that these proteins were unlikely to account for adhesion observed between 1610 cells. βadp1 – a novel inhibitor of β1-mediated adhesion. (A) Representative traces (top) and summary plot (bottom) of intercellular junctional resistance measured by ECIS in 1610 β1OX, and 1610 Parental cells (five experimental replicates with two technical replicates per experiment; 4 × 104 cells/well). (B) Homology model of the β1 ectodomain based on the β3 crystal structure, with the βadp1 sequence highlighted. (C) Docking of βadp1 with the β1 homology model in silico in a low-energy conformation with the adhesion surface of the β1 Ig loop. (D) Representative traces (left) and summary plot (right) demonstrating the effects of βadp1 on intercellular junctional resistance in 1610 β1OX and 1610 parental cells (five experimental replicates with two technical replicates per experiment, 104 cells/well, *p<0.05 by 2-factor ANOVA). (E) Effects of βadp1 on the formation of intercellular interactions between sub-confluent 1610 β1OX and 1610 Parental cells, quantified as the change in resistance over 24 hr following plating in the absence/presence of βadp1. Our strategy for preparing a rationally designed antagonist of β1-mediated adhesion was based on an approach successfully applied to two other adhesion proteins of the Ig domain family that share homologies with β1: N-cad (Williams et al., 2000a; Williams et al., 2000b) and desmoglein-1 (Schlipp et al., 2014). This method involves synthesizing a peptide mimicking the adhesion sequence within the Ig loop domain. The location of the adhesion receptor in sodium channel β Ig domain has been characterized in previous structure and function studies (Brackenbury and Isom, 2011; Malhotra et al., 2000; Patino et al., 2009). Based on the recently resolved crystal structure of β3, and structural data from cryo-electron microscopy studies of β1 in the electric eel, we generated a molecular homology model of β1 using SWISS-MODEL (Figure 3B) (Namadurai et al., 2014). We then identified an amino acid sequence (1FVKILRYENEVLQLEEDERF20: βadp1) within the β1 Ig domain homologous to the desmoglein-1 Ig loop adhesion sequence - a peptide mimetic of which acts as a competitive inhibitor of desmosomal adhesion (Harrison et al., 2016). To assess the interaction of βadp1 with β1, and thus its potential ability to act as a competitive inhibitor of β1 adhesion, we allowed the peptide to bind freely to the β1 homology model in silico, determining that it associated with the adhesion surface of the Ig loop (Figure 3C). MM-GBSA refined docking of βadp1 using Maestro displayed a low energy conformation (ΔG binding −44.47) at this location. The predicted binding pose revealed stabilization of this conformation via a network of intramolecular hydrogen bonds, and electrostatic interactions between the C-terminal end of βadp1 and polar residues within the β1 adhesion domain, as well as accommodation of hydrophobic residues of βadp1 within pockets along the β1 adhesion surface. Sequences of similar length from the Ig loop outside of the adhesion domain, as well as a randomized βadp1 sequence (βadp1-scr), did not show propensity to interact with the adhesion surface of the β1 extracellular domain. Substituting the basic arginine (R) at position 19 of βadp1 with acidic aspartic acid (D) yielded a sequence (βadp1-R85D) with significantly abrogated binding to the β1 model in silico (ΔG binding −18.05). The arginine at this position of βadp1 corresponds to R85 on full length β1 and is a mutational hotspot associated with diseases of electrical excitation in the heart and brain of humans (Calhoun and Isom, 2014; Thomas et al., 2007). 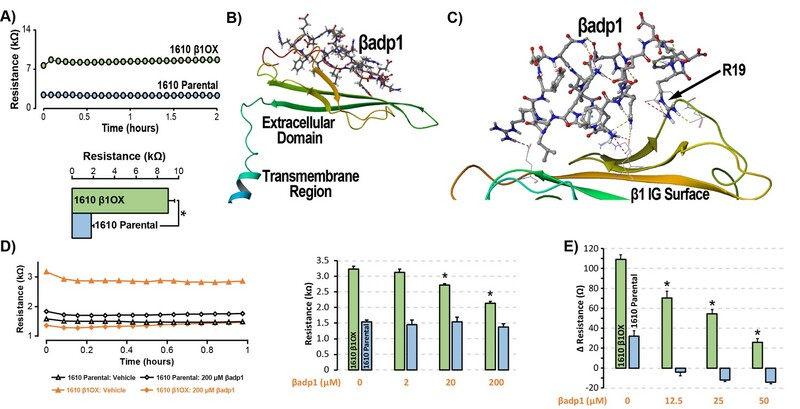 We next assessed the ability of βadp1 to abrogate β1 adhesion using the 1610 β1OX model. βadp1 significantly, persistently and dose-dependently decreased junctional resistance in confluent monolayers of 1610 β1OX cells, but not in 1610 parental cells (Figure 3D), which express negligible levels of β1. These results suggest that βadp1 selectively inhibited the intercellular adhesion function of β1 in this in vitro model. Similarly, βadp1 efficiently and dose-dependently inhibited the formation of intercellular interactions between sub-confluent 1610 β1OX cells forming into monolayers (Figure 3E), doing so at lower concentrations of peptide than necessary for established confluent monolayers of β1 over-expressing cells. Neither the treatment of 1610 β1OX cells with βadp1-R85D (Figure 3—figure supplement 1), nor the treatment 1610 parental cells with βadp1 (Figure 3D,E) affected the establishment of cell-cell contacts, as assessed by ECIS. βadp1 showed no evidence of toxic effects on 1610 β1OX cells, or the mouse ventricular myocyte cell line H9C2 even at concentrations twice that used elsewhere in this study (Figure 3—figure supplement 2), suggesting that the peptide’s action was unlikely to result from cellular toxicity. LSCM and STORM results described above demonstrate that perinexal ID regions show high enrichment for β1. Perfusion of βadp1 into Langendorff-perfused GP hearts had profound yet highly selective effects on the ultrastructure of these regions (Figure 4). A confocal image of a section from a GP ventricle perfused with biotinylated βadp1 (βadp1-b; 100 µM) in Figure 4A shows punctate βadp1-b signal (red) adjacent to Cx43 immunosignal (green), consistent with the peptide localizing in perinexal regions of the ID. Representative images (Figure 4B) obtained by transmission electron microscopy (TEM) illustrate close apposition between perinexal membranes in control tyrode-perfused GP ventricles and markedly wider spacing between perinexal membranes in βadp1-treated hearts, reflecting that βadp1 treatment induced a de-adhesion of the β1-enriched membranes of the perinexus. (A) A representative confocal image from a GP LV perfused with biotinylated βadp1 (βadp1-b) shows Cx43 (green) and βadp1-b (red) immunosignals. (B) Representative TEM images of GJ and perinexi from hearts perfused with control Tyrode’s solution (top) and βadp1 (100 µM; bottom). (C) A summary plot of inter-membrane distance at perinexal (open bars) and non-junctional ID (hatched bars) from hearts perfused with vehicle (white), βadp1 (orange), or a scrambled version of βadp1 (βadp1-scr; gray) [n = 3 hearts/dose, *p<0.05 by 2-factor ANOVA]. Overall, quantification of TEM images indicated that βadp1 increased inter-membrane distance in dose-dependent fashion within perinexi, but importantly, not at other ID locations distal from GJs (Figure 4C). In contrast, a scrambled control peptide (βadp1-scr; 10 µM) did not significantly affect inter-membrane spacing at perinexal or non-perinexal ID sites. These results indicate that βadp1 selectively, and dose-dependently, widened β1-enriched perinexi – a dehiscence of these nanodomains that would be consistent with the specific antagonism of β1-mediated adhesion within the ID by the inhibitory peptide. To further investigate the effects of loss of β1 function on perinexal ultrastructure, we examined ventricles from Scn1b -/- (β1-null) mice. β1-null ventricles displayed striking evidence of perinexal de-adhesion, with > 4 fold greater perinexal inter-membrane distances compared to wild-type (WT) littermates, while inter-membrane distance at non-perinexal ID sites was not different between the two genotypes (Figure 4—figure supplement 1). These results are consistent with the effects of βadp1 in GP ventricles. In previous studies, we showed that acute interstitial edema increased perinexal membrane spacing at these NaV1.5-enriched nanodomains and precipitated anisotropic conduction slowing (Veeraraghavan et al., 2015) – an effect on cardiac conduction that could only be explained by a computer model incorporating both ephaptic and electrotonic (i.e. GJ-based) coupling, and not by one incorporating electrotonic coupling alone. The level of perinexal de-adhesion caused by βadp1 was more marked than that prompted by experimentally induced edema. Thus, the aforementioned results suggested the potential of βadp1 as a tool for selectively probing the contribution of β1, and by extension, the hypothesized ephaptic mechanism, to action potential (AP) propagation between myocytes. 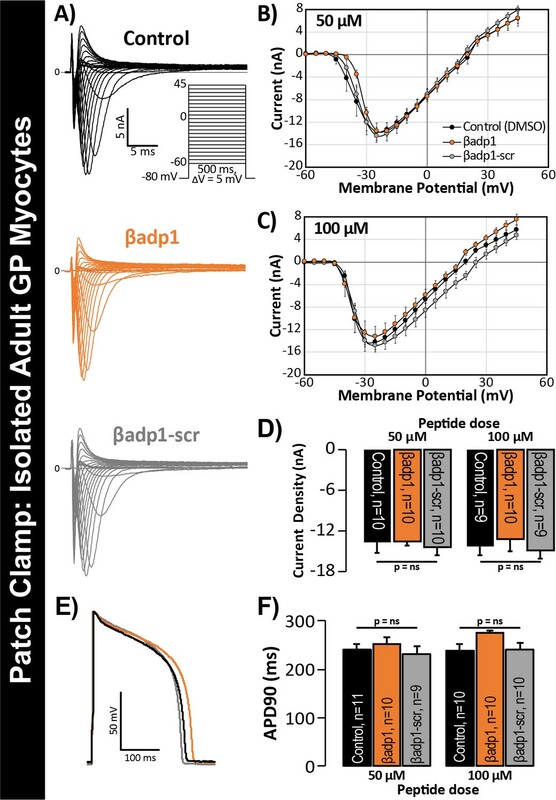 As a first step to assess the effects of βadp1 on intercellular conduction of electrical impulse, we undertook voltage and current clamp studies on single myocytes isolated from GP hearts to determine whether the peptide affected AP and/or sodium channel function properties independent of whether cells where attached to one another. Neither βadp1, nor a scrambled control peptide (βadp1-scr), measurably altered the sodium current (INa; Figure 5A–D) or the duration or morphology of action potentials (APs; Figure 5E–F), suggesting that neither peptide affected the function of the Na+ channel complex, or other ion channels, in isolated, non-contacting cells. βadp1 effects on INa, APs. (A) Representative INa traces from myocytes during vehicle control, or treatment with βadp1 or βadp1-scr. Current-voltage relationships during treatment with (B) 50, or (C) 100 µM peptides. (D) Summary plots of INa density. (E) Representative AP traces and (F) AP duration during peptide treatment. Number of cells measured indicated on bar graphs. Next, we investigated whether selective targeting of the β1 adhesion domain affected Na+ channel activity in cells forming adherent contacts with each other. The rationale for our approach was as follows: The ephaptic coupling hypothesis implies that NaV1.5 channels on one cell’s membrane can trans-activate NaV1.5 channels on another cell membrane provided the two cells are separated by a sufficiently narrow extracellular cleft (Mori et al., 2008; Lin and Keener, 2014). Indeed, β1-mediated adhesion between cells may be critical to such a phenomenon by generating the close membrane apposition required for ephapse formation. Thus, modulating β1-mediated adhesion may alter the current from ID-localized NaV1.5 in the presence of cell-to-cell contacts. To test this hypothesis, we quantified INa from cell-to-cell contact sites using scanning ion conductance microscopy (SICM) –guided smart patch clamp (SPC) in Cx43-EGFP-expressing neonatal rat ventricular myocyte (NRVM) cultures (Figure 6). Confocal immunolabeling of NRVMs revealed close association of β1 signals with Cx43 GJs at cell-to-cell contact sites (Figure 6A, Figure 6—figure supplement 1), consistent with observations from GP ventricles (Figure 1, Figure 1—figure supplement 3). Under control conditions, local INa density at junctional sites proximal to Cx43-EGFP fluorescence, quantified by SPC, was significantly greater than that measured at non-junctional sites (Figure 6—figure supplement 2B), in line with previous reports of higher INa density at the ID relative to the lateral membrane (Lin et al., 2011). Treatment with βadp1, but not βadp1-scr, significantly reduced INa density at junctional sites (Figure 6B–E, Figure 6—figure supplement 2C,D). Currents at membrane sites distal from Cx43-GFP loci were not affected (Figure 6—figure supplement 2E). Importantly, and as was observed in isolated adult myocytes (Figure 5D), neither peptide altered whole cell INa density (Figure 6F). These observations indicated that whilst disruption of β1-mediated adhesion caused localized changes in Cx43-GJ-adjacent INa current density, global INa density across the entire cell remained unaffected – results consistent with β1 maintaining the high density of trans-activating sodium channels at the perinexus necessary for the hypothesized ephaptic conduction mechanism. (A) Representative confocal image of NRVMs labeled for Cx43 (red) and β1 (green). (B) Paired brightfield and fluorescence images along with an overlay demonstrate Cx43-EGFP fluorescence at cell-to-cell contacts. (C) Paired images of cell surface (SICM) and Cx43-EGFP fluorescence (surface scanning confocal microscopy; SSCM) at a cell-to-cell contact site. (D) Representative SICM images of cell-to-cell contacts under control conditions and following 30 min of treatment with βadp1 or βadp1-scr (50 µM) illustrate sites where INa was measured using SPC. (E) Representative traces and summary plot of INa from Cx43-EGFP fluorescence-adjacent junctional sites (Control: n = 12, βadp1: n = 8, βadp1-scr: n = 6; *p<0.05 vs control). (F) Representative traces and summary plot of whole-cell INa density (n = 6/ group). To probe whether loss of β1 adhesion, and the consequent perinexal dehiscence and reduction in GJ-associated INa, affected cardiac conduction, we assessed the electrophysiologic impact of βadp1 treatment in Langendorff-perfused GP hearts. Representative electrocardiogram (ECG) traces in Figure 7A of intrinsic activity demonstrate prolongation of the QRS complex and the QT interval in the presence of βadp1 (orange trace) compared to control (black trace). Overall, βadp1, but not βadp1-scr, significantly prolonged both the QRS complex (Figure 7B) and the QT interval (Figure 7C), indicating that βadp1 impaired conduction. The QRS prolongation elicited by βadp1 occurred in a dose-dependent manner (Figure 7D). Further, βadp1 prolonged both the QRS complex and the QT interval to similar extents, suggesting that the ST segment and therefore, AP duration, was not prolonged. βadp1 effects on cardiac electrophysiology. (A) Representative traces of volume-conducted ECGs from GP ventricles during control (black) and βadp1 (10 µM; orange) perfusion. The solid gray vertical line marks the start of the QRS in both traces while gray and red dotted lines mark the end of the QRS in the control and βadp1 traces, respectively. Likewise, gray and red dashed lines mark the ends of the T wave in the control and βadp1 traces, respectively. The bottom orange trace shows an example of a polymorphic ventricular tachycardia (PVT) observed during βadp1 perfusion. Summary plots of (B) QRS duration and (C) QT interval during control, βadp1 (10 µM) and βadp1-scr (10 µM) perfusion (*p<0.05 vs. control). (D) Summary plot of QRS prolongation relative to control induced by different doses of βadp1 (*p<0.05 vs. control). Representative optical (E) APs and (F) isochrone maps of activation during unipolar epicardial pacing during control and βadp1 treatment (10 µM). The white symbols indicate the sites of pacing. (G) Summary plots of longitudinal conduction velocity (CVL; top), transverse conduction velocity (CVT; middle) and anisotropy ratio (AR; bottom) during control (white), βadp1 (10 µM; orange) and βadp1-scr (10 µM; gray) perfusion (*p<0.05 vs. control). (H) Summary plots of normalized CVL (top), CVT (middle) and AR (bottom) at different doses of βadp1 during pacing at 300 ms cycle length (n = 3 per dose per treatment, *p<0.05 by 2-factor ANOVA). Representative optical APs in Figure 7E demonstrate similar AP duration during control (black) and βadp1 (orange), consistent with ECG findings. Representative optical isochrone maps in Figure 7F show elliptical spread of activation from sites of unipolar epicardial pacing (white symbols). The maps also reveal crowding of isochrones, particularly along the transverse axis of propagation, in the presence of βadp1 (bottom) relative to control (top). This indicates preferential slowing of transverse conduction in the presence of βadp1. Summary plots in Figure 7G demonstrate that even low concentrations (10 µM) of βadp1 significantly slowed transverse conduction, thereby, increasing anisotropy, whereas βadp1-scr did not measurably affect conduction. In accordance with QRS prolongation, βadp1 reduced CV in a dose-dependent manner (Figure 7H): All doses tested (1–100 µM) preferentially decreased transverse conduction and increased anisotropy, while the higher concentrations (50 and 100 µM) also slowed longitudinal conduction. Importantly, the anisotropic conduction slowing induced by βadp1 proved proarrhythmic in a dose-dependent manner (Figure 7A, bottom trace; Figure 7—figure supplement 1): spontaneous ventricular tachycardias (VTs) were observed in the presence of βadp1 at doses (in µM) of 10 (1/3 hearts, p=0.2 vs. vehicle), 50 (2/3 hearts, p<0.05 vs. vehicle) and 100 (3/4 hearts, p<0.05 vs. vehicle). In contrast, no arrhythmias were observed in the presence of vehicle (DMSO; 0/3 hearts), or βadp1-scr (0/3 hearts). In order to confirm that the impact of βadp1 reflected effects on AP conduction between cardiomyocytes, and was not due to effects on non-myocyte cells and tissues, we performed additional experiments assessing excitation spread in monolayers of human-induced pluripotent stem-cell-derived cardiomyocytes (iPSC-CMs). Immuno-confocal microscopy revealed enrichment of both NaV1.5 and β1 adjacent to Cx43 at cell-to-cell contacts (Figure 7—figure supplement 2A,B), consistent with results in adult GP ventricles (Figures 1 and 2) and NRVMs (Figure 6A). In optical mapping experiments, treatment with βadp1, but not βadp1-scr, increased activation delay between equally spaced sites (Figure 7—figure supplement 2C) and slowed conduction in a dose-dependent manner (Figure 7—figure supplement 2D). Taken together with the results from GP ventricles, these data suggest that selective inhibition of β1-mediated adhesion slows conduction between cardiac myocytes in a cell-specific and pro-arrhythmic manner. In this study, we provide evidence that sodium channel complexes concentrated at the edge of GJs (i.e. in the perinexus) could provide a structural basis for ephaptic conduction in the heart (Figure 8). Importantly, we find that the extracellular adhesion domain of the sodium channel β1 subunit may be critical for the generation of the close (<30 nm) cell-cell interactions necessary for this mechanism to operate. Selective inhibition of β1-mediated adhesion profoundly disrupts the structure of GJ-adjacent perinexi, causing them to dehisce/de-adhere, and swell beyond limits that would theoretically support ephaptic conduction, with attendant loss of perinexal sodium currents, anisotropic conduction slowing and arrhythmias. The clinical translational significance of perinexal dehiscence is further emphasized by our recent report that it is associated with the occurrence of atrial fibrillation in human patients (Raisch et al., 2018). Interestingly, the physical extent of the β1 extracellular domain predicted by our molecular homology model (Figure 3B) is 7–15 nm, depending on relaxation state of the domain. Thus, the span of two β1 extracellular domains on apposed cell membranes in trans homophilic interaction concurs with the EM-based measurements of average perinexal width (15–30 nm) in untreated hearts that we report here, and elsewhere (Veeraraghavan et al., 2015). Schematic diagram of the cardiac ephapse. Top. A schematic diagram illustrating the organization of NaV1.5, β1, Cx43 and N-cad to different ID nanodomains. Note that plicate (fascia adherens/area composita) and interplicate (GJ, perinexus) regions of the ID are displayed side-by-side for convenience of representation, although they are, in reality, oriented along perpendicular axes. Bottom left. Illustration of an intact perinexus with close membrane apposition displayed with an ECG trace of intrinsic activity and illustration of normal intrinsic activation sequence represented on a diagram of the heart. The earliest sites of activation are represented in blue, and the latest in red as illustrated by the color bar. Bottom right. Illustration of a widened perinexus resulting from βadp1 inhibition of β1-mediated adhesion with an ECG trace of a resulting PVT and illustration of arrhythmic activation sequence represented on a diagram of the heart. Ephaptic coupling has been observed in neural (Anastassiou et al., 2011; Bokil et al., 2001; Chan et al., 1988; Faber and Korn, 1989; Jefferys, 1995; Su et al., 2012; Voronin, 2000), and other (Klaassen et al., 2012; Young, 2007) tissues, and has long been hypothesized to occur in the heart (Mori et al., 2008; Hichri et al., 2018; Kucera et al., 2002; Lin and Keener, 2013; Sperelakis, 2002). Early work on ephaptic coupling in the heart was motivated by the fact that GJs, which are abundant in mammalian hearts, are over two orders of magnitude less frequent in other chordates, especially birds (Martínez-Palomo and Mendez, 1971; Shibata and Yamamoto, 1979). Mathematical modeling suggests that this level of GJ coupling is unlikely to reliably support the beat-to-beat conduction of AP long-term, thus indicating that an alternate paradigm for AP conduction may operate in bird hearts. Nevertheless, the investigation of ephaptic conduction has remained largely theoretical and the hypothesis has drawn considerable skepticism over the years. The present study identifies a potential structural unit within the ID located at the edge of GJs – the ephapse – that may provide a mechanistic basis for ongoing studies of this long-theorized mechanism of cardiac AP conduction. Subcellular distribution (and thus, nano-structural context) has emerged as an important modulator of NaV1.5 function (Hichri et al., 2018; Petitprez et al., 2011; Lin et al., 2011; Chen-Izu et al., 2015; Eichel et al., 2016; Hund and Mohler, 2014; Makara et al., 2014): NaV1.5 has been reported to be divided into lateral and ID-localized pools based on its sarcolemmal localization, differences in scaffolding partners, and current properties. Interestingly, Hichri and colleagues recently demonstrated that NaV1.5 behavior is influenced by channel clustering, and localization facing narrow extracellular clefts (Hichri et al., 2018), raising the possibility of NaV1.5 pools playing different, ultra-structure dependent roles. Here, using super-resolution STORM-RLA (Veeraraghavan and Gourdie, 2016), we further categorize ID-localized NaV1.5 into a ‘perinexal pool’ adjacent to Cx43 and a ‘plicate pool’ that co-distributes with N-cad. The perinexal pool is in agreement with our demonstration of NaV1.5 enrichment proximal to Cx43 GJs (Veeraraghavan et al., 2015; Veeraraghavan and Gourdie, 2016; Rhett et al., 2012; Veeraraghavan et al., 2016), while the plicate pool is consistent with the results of Leo-Macias and colleagues who reported NaV1.5 co-distributing with N-cadherin-positive adherens junctions within the ID (Leo-Macias et al., 2016). Whilst adjacent cell membranes are very closely apposed (5–15 nm) within the perinexus (Veeraraghavan et al., 2015), they are further apart (63 nm) in the vicinity of adhesion complexes within plicate ID regions (Leo-Macías et al., 2015). Given that theoretical studies indicate that membrane spacing of ≤30 nm would be necessary to support ephaptic coupling (Mori et al., 2008; Greer-Short et al., 2017), the plicate NaV1.5 pool is unlikely to play a role in ephaptic coupling. Nonetheless, whilst closely approximated, trans-activating sodium channels at GJ perinexi may act to ‘trigger’ a local depolarization of interplicate membrane, the function of the nearby pools of plicate NaV1.5 channels could be to provide cis-activated excitatory current, contributing to the spread of depolarization through the downstream myocyte. The approach we took to developing a competitive inhibitor of β1 was based on a methodology successfully applied by independent groups to two other Ig domain adhesion molecules that share homologies with β1: N-cad (Williams et al., 2000a), and desmoglein (Schlipp et al., 2014). This strategy involved generating a peptide mimetic of the extracellular adhesion sequence of the β1 Ig domain. In ECIS experiments, β1 overexpression conferred strong adhesion to 1610 cells, which was selectively and dose-dependently inhibited by βadp1 treatment. 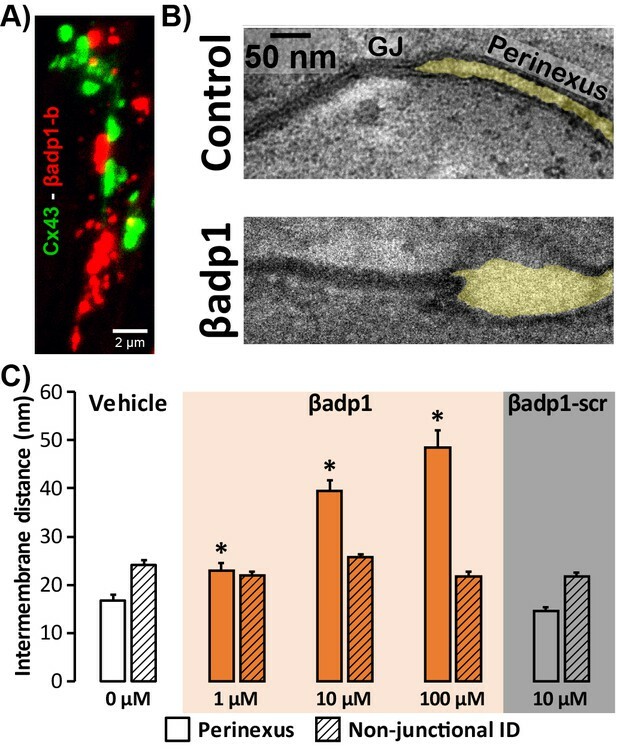 When perfused into GP ventricles, βadp1 prompted dose-dependent increases in inter-membrane distance, selectively within perinexi. Similar effects were not observed in hearts treated with a scrambled control peptide, βadp1-scr. The conspicuous de-adhesion of perinexal membranes prompted by βadp1 in GP hearts, and by germline loss of Scn1b/β1 in mice was selective to perinexal nanodomains, with inter-membrane spacing at other ID locations (e.g. within adherens junctions and desmosomes) remaining unaffected in both GPs and mice. These results, along with the demonstration that βadp1 treatment had no effects on whole-cell INa, but results in localized loss of INa adjacent to Cx43-GFP GJs, attest to the selectivity of the novel inhibitor of β1-mediated adhesion. Further, these findings suggest that the increases in extracellular cleft width adjacent to Cx43 GJ induced by inhibition of β1-mediated adhesion likely compromises trans-activation of Na+ channels within these nanodomains. Ongoing studies would usefully determine the basis of this localized down-regulation of channel activity. Crucially, the fact that βadp1 treatment of myocyte monolayers elicits these localized changes in INa within GJ-adjacent nanodomains, without alteration of whole-cell INa, indicates the possibility of local remodeling of Na+ channel complexes from perinexal nanodomains. Examining the functional impact of βadp1 treatment on Langendorff-perfused GP ventricles, we observed prolongation of the QRS complex, pointing to conduction slowing. The QT interval was also prolonged by a similar degree as the QRS complex, indicating no change in ST segment duration. This is consistent with the absence of APD changes following βadp1 treatment in both isolated myocytes and in intact ventricles. The contrast between these results, and those reported in mice lacking β1 (β1-null), where QT prolongation was associated with prolonged AP duration (Lopez-Santiago et al., 2007), likely stem from the differences between acutely and selectively inhibiting β1-mediated adhesion (as in the present study), versus chronic genetic ablation of β1 expression. As yet, conduction velocity measurements have not been reported from the ventricles of β1-nulls, which in light of the data reported herein would be a useful addition to our understanding of cardiac conduction mechanisms. In keeping with the observed QRS prolongation, βadp1 treatment dose-dependently slowed transverse conduction in intact ventricles, increasing the anisotropy of conduction, and precipitating spontaneous arrhythmias. We have previously demonstrated in silico that anisotropic conduction slowing secondary to a reduction of INa at the ID results from compromised ephaptic coupling (Veeraraghavan et al., 2015): Briefly, a wavefront traveling transverse to the fiber axis encounters more cell-cell junctions per unit distance than one traveling longitudinally. Therefore, compromised cell-cell coupling via perinexal nanodomains would have a greater impact on transverse conduction than on longitudinal conduction. 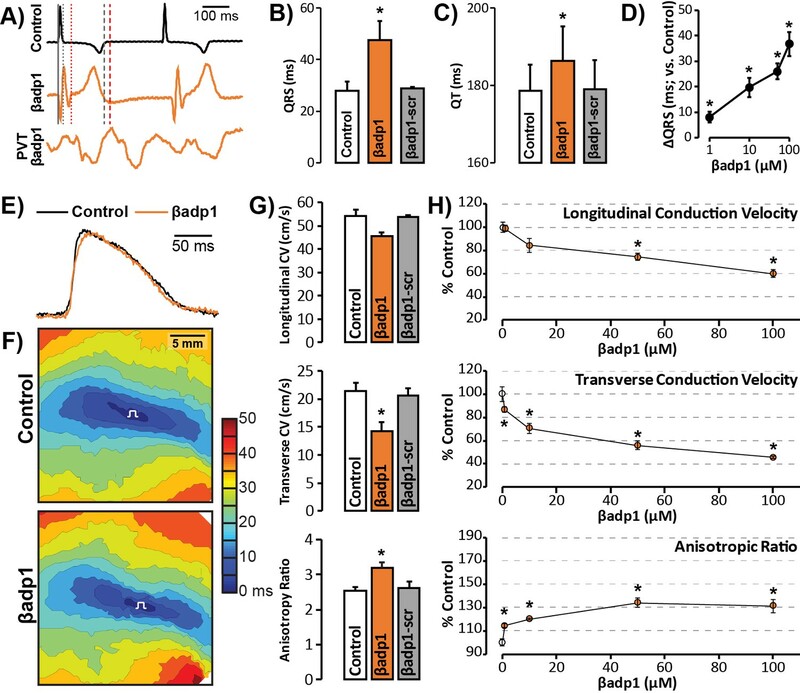 Thus, the anisotropic nature of conduction slowing caused by βadp1 is consistent with disruption of ephaptic communication (Plonsey and Barr, 2007), and identifies a hitherto unanticipated role for β1-mediated adhesion in the heart. Taken together, these data lend further support to the hypothesis that β1 adhesion mediates close apposition between NaV1.5-rich membranes within the perinexus, facilitating ephaptic coupling between cardiac myocytes (Figure 8). In this context, the fact that βadp1 mimics a sequence in β1 (i.e. its Ig domain adhesion sequence) that is a ‘hot spot’ for disease-causing mutations, including mutations associated with atrial arrhythmia (R85H) (Watanabe et al., 2009), conduction disease (R85H) (Watanabe et al., 2009), epilepsy (R85H, R85C) (Scheffer et al., 2007), Brugada syndrome (E87Q) (Hasdemir et al., 2015), and febrile epilepsy (I70_E74del) (Audenaert et al., 2003) lends further support to the importance of β1-mediated adhesion to electrical propagation in the heart, and beyond. Interestingly, a single amino acid substitution of R to D at the R85 ‘hot spot’ within βadp1 significantly abrogated the cell adhesion-inhibitory effects of the peptide. These data suggest that disease-causing mutations associated with this locus may mediate their effects via perinexal disruption. In summary, we provide experimental evidence suggesting that ephaptic conduction may play a role in the heart, identifying hitherto unanticipated assignments for both NaV1.5 and β1 in this phenomenon. Although limitations of current technology prevent direct interrogation of electrophysiology at the nanoscale, which would provide direct proof of the ephaptic mechanism, our results strongly suggest a role for it in normal cardiac physiology. Thus, it has not escaped our notice that modulation of β1-mediated adhesion could represent a novel clinical target for the amelioration of cardiac arrhythmias. Increased spacing of perinexal membranes, whether resulting from inhibition of β1-mediated adhesion, or acute interstitial edema, is strongly associated with ventricular arrhythmias. Given that humans with atrial fibrillation also demonstrate perinexal dehiscence (Raisch et al., 2018), these data suggest that drugs that act to stabilize and/or enhance β1-mediated adhesion within IDs could have anti-arrhythmic potential. Hearts were isolated from male retired breeder guinea pigs (GPs), and 19-day-old Scn1b -/- mice, perfused as Langendorff-preparations, or preserved for cryosectioning or transmission electron microscopy (TEM). Immunofluorescent staining was performed, as previously described (Veeraraghavan et al., 2015; Veeraraghavan and Gourdie, 2016; Veeraraghavan et al., 2016), on 5 µm cryosections of tissue, and monolayers of cells fixed with paraformaldehyde (2%; 5 min at room temperature). Confocal imaging was performed using a TCS SP8 confocal microscope, while super-resolution STochastic Optical Reconstruction Microscopy (STORM) was performed using a Vutara 350 microscope. Single molecule localization data from STORM was quantitatively analyzed using STORM-RLA as previously described (Veeraraghavan and Gourdie, 2016). Intercellular junctional resistance was quantified using an ECIS Zθ system in 1610 cells stably overexpressing β1 (1610 β1OX) as well as in parental 1610 cells (1610 Parental). TEM images of the ID, particularly GJs and mechanical junctions, were obtained at 100,000x magnification on a JEOL JEM-1400 electron microscope. Myocytes were isolated from adult GP hearts by enzymatic dispersion. Action potentials and Na+ currents were recorded by current clamp, and voltage clamp, respectively. Neonatal rat ventricular myocytes (NRVMs) were isolated by a combination of mechanical dissociation, and enzymatic degradation, and cultured as monolayers. SSCM, which combines scanning ion conductance microscopy (SICM) with confocal microscopy, was used to concurrently image membrane topology and fluorescent signals. Local INa from regions thus identified were recorded by SPC as previously described (Bhargava et al., 2013). Additionally, whole-cell INa was measured from NRVMs by voltage clamp. Whole heart electrophysiology was assessed by volume-conducted electrocardiograms (ECG), and optical voltage mapping using the voltage-sensitive dye, di-4-ANEPPS (15 µM), as previously described (Veeraraghavan et al., 2015; Veeraraghavan et al., 2016; Veeraraghavan and Poelzing, 2008). The investigation conforms to the Guide for the Care and Use of Laboratory Animals published by the US National Institutes of Health (NIH Publication No. 85–23, revised 1996). All animal study protocols (15-130, 15-134, 12-140) were approved by the Institutional Animal Care and Use Committee at the Virginia Polytechnic University. Male retired breeder, albino Hartley guinea pigs (GPs; Hilltop Lab Animals, Scottsdale, PA, USA;~900–1200 g, 13–20 months old) were anesthetized with 5% isoflurane mixed with 100% oxygen (3 l/min). After loss of consciousness, anesthesia was maintained with 3–5% isoflurane mixed with 100% oxygen (4 l/min). Once the animal was in a surgical plane of anesthesia, the heart was excised and the ventricles were either fixed for transmission electron microscopy (TEM), frozen for cryosectioning/Western immunoblotting or perfused (at 40–55 mm Hg) as Langendorff preparations with oxygenated Tyrode’s solution (containing, in mM: CaCl2 1.25, NaCl 140, KCl 4.5, dextrose 5.5, MgCl2 0.7, HEPES 10; pH adjusted to 7.41 with ~5.5 mM NaOH) at 37°C as previously described (Poelzing and Veeraraghavan, 2007; Veeraraghavan et al., 2015; Veeraraghavan et al., 2016; Veeraraghavan and Poelzing, 2008). Additionally, Scn1b -/- (β1-null) and Scn1b +/+ (wild-type; WT) mice were generated as previously described (Lopez-Santiago et al., 2007), and their ventricles were processed for TEM as noted above. Murine tissue samples were collected from 19 day-old mice, because the loss of β1 is lethal from the 2nd week of life onwards. Immunofluorescent staining was performed, as previously described (Veeraraghavan et al., 2015; Veeraraghavan et al., 2016; Veeraraghavan and Gourdie, 2016), on 5 µm cryosections of tissue, and monolayers of cells fixed with paraformaldehyde (2%; 5 min at room temperature). Samples were labeled with our novel rabbit polyclonal antibodies against either NaV1.5 (Epitope: 1996HSEDLADFPPSPDRDRESIV2016) or β1 (Epitope: 44KRRSETTAETFTEWTFR60). Validation results for these antibodies are presented in Figure 1—figure supplement 1. In some cases, samples were co-labeled with a mouse monoclonal antibody against either connexin43 (Cx43; Millipore MAB3067, 1:250) or N-cadherin (N-cad; BD Biosciences 610920, 1:100). For confocal microscopy, samples were then labeled with goat anti-rabbit AlexaFluor 568 (1:4000; ThermoFisher Scientific, Grand Island, NY) and goat anti-mouse AlexaFluor 633 (1:4000; ThermoFisher Scientific, Grand Island, NY) secondary antibodies. For super-resolution STochastic Optical Reconstruction Microscopy (STORM), samples were labeled with goat anti-rabbit Alexa 647 (1:4000) and donkey anti-mouse Cy3b (1:100) secondary antibodies (ThermoFisher Scientific, Grand Island, NY) and stored in Scale U2 buffer (Hama et al., 2011) for 48 hr at 4°C. Confocal imaging was performed using a TCS SP8 laser scanning confocal microscope equipped with a Plan Apochromat 63x/1.4 numerical aperture oil immersion objective and a Leica HyD hybrid detector (Leica, Buffalo Grove, IL). Individual fluorophores were imaged sequentially with the excitation wavelength switching at the end of each frame. Whole cell lysates were prepared from frozen GP ventricles and 1610 cells; membrane lysates were prepared from brains of β1 -/- (β1-null) (Lopez-Santiago et al., 2007), and WT littermate mice as previously described (Veeraraghavan and Poelzing, 2008; Rhett et al., 2011). These were electrophoresed on 4–15% TGX Stain-free (for NaV1.5) or 12% Bis-Tris (for β1) gels (BioRad, Hercules, CA) before being transferred onto a polyvinylidene difluoride (PVDF) membrane. The membranes were probed with our novel rabbit polyclonal antibodies against NaV1.5 or β1, followed by a goat anti-rabbit HRP-conjugated secondary antibody (JacksonImmuno, West Grove PA). Signals were detected by chemiluminescence using SuperSignal West Dura Extended Duration Substrate (ThermoFisher Scientific, Grand Island, NY) and imaged using a Chemidoc MP imager (BioRad, Hercules, CA). For the GP ventricle and 1610 cell lysates, prep gels with a single 700 µl well were used, and following transfer, vertical strips cut from the PVDF membrane to be probed with different antibody solutions. Standard 12-well gels were used for the mouse brain lysates so that β1-null and WT mouse lysates could be run in alternating lanes. Stock antigen peptides were diluted (NaV1.5 in TBST, β1 in DMSO) to 0.5 µg /µl followed by serial dilutions to 1:10 and 1:100. PVDF membranes were rehydrated in methanol, water, and then TBST before being transferred to blot paper to absorb excess moisture. Peptide or control solutions (2 µl) were spotted onto the damp membranes. The membranes were air-dried, rehydrated, and blocked for 1 hr at room temperature (RT). Primary antibodies were added and incubated overnight at 4°C. The membranes were washed in TBST (1 × 10 s, 2 × 5 min) followed by incubation with goat anti-rabbit horseradish peroxidase at RT for 1 hr. Antibody-peptide interactions were detected using chemiluminescence substrate Super Signal West Femto (ThermoFisher Scientific, Grand Island, NY) per manufacturer’s instructions. The chemiluminescence signal was digitally captured using a ChemiDoc MP imager (BioRad, Hercules, CA). STORM imaging was performed using a Vutara 350 microscope equipped with biplane 3D detection (Deschout et al., 2014; Juette et al., 2008; Mlodzianoski et al., 2009), and fast sCMOS imaging achieving 20 nm lateral and 50 nm axial resolution. Volumes imaged spanned between 10 × 10 µm and 15 × 15 µm along the x-y plane and 3–5 µm in the z-dimension. Localization of particles was accomplished with a precision of 10 nm. Registration of the two-color channels was achieved using a transform calculated from the localized positions of several TetraSpeck Fluorescent Microspheres (ThermoFisher Scientific, Carlsbad, CA) scattered throughout the field of view, similar to a previously described approach (Churchman and Spudich, 2013). The images were quantitatively analyzed using STORM-RLA as previously described (Veeraraghavan and Gourdie, 2016). In order to probe β1-mediated adhesion, Chinese hamster lung 1610 cells (ATCC CRL-1657; tested negative for mycoplasma), which do not endogenously express β1 (Isom et al., 1995), were used as a heterologous expression system. Studies were conducted in 1610 cells stably overexpressing β1 (1610 β1OX) as well as in parental 1610 cells (1610 Parental). The species identity of the 1610 cells was confirmed by COI assay, and the cell-type identity confirmed based on morphological characteristics. The effects of peptide treatment on the viability of cells was assessed using a colorimetric assay (Cell Proliferation Reagent WST-1, Sigma-Aldrich, St. Louis, MO). Briefly, H9C2 cells (ATCC CRL-1446; tested negative for mycoplasma) were cultured at 37°C and 5% CO2 in microplates (96-well, flat bottom) with each well seeded with 5 × 104 cells in 100 μl culture media containing peptide or vehicle. After 24 hr, WST-1 (10 μl/well) was added, and allowed to incubate for 4 hr at 37°C and 5% CO2. The microplate was thoroughly shaken for one minute before max absorption of 440 nm was quantified using a plate reader (SpectraMax i3) with background subtracted by reference wavelength of 600 nm. Cell viability was calculated as the ratio of corrected signal from peptide-treated samples to corrected signal from vehicle-treated controls (reported as a percentage). The species identity of the H9C2 cells was confirmed by COI assay, and the cell-type identity confirmed based on morphological characteristics. The resistance of monolayers of 1610 cells was quantified using an ECIS Zθ system (Applied Biophysics, Troy, NY) over a range of 62.5 to 4000 Hz, previously demonstrated to reflect intercellular junctional resistance (Moy et al., 2000; Tiruppathi et al., 1992). Briefly, 1610 cells (400 µl/well, 2–10 × 104 cells/ml) were plated on 8W10E + 8-well dishes (Applied Biophysics, Troy, NY) where each well was equipped with 40 gold electrodes, and their impedance measured every 90 s for 3 hr. Resistance was quantified as the real component of the impedance and intercellular junctional resistance calculated as the average resistance between 62.5 and 4000 Hz. Cubes of tissue (1 mm side) were taken from the anterior LV free wall of GP and mouse hearts and fixed overnight in 2% glutaraldehyde at 4°C. TEM images of the ID, particularly GJs and mechanical junctions, were obtained at 100,000x magnification on a JEOL JEM-1400 electron microscope. Intermembrane distance at perinexal and non-perinexal sites was quantified using ImageJ (NIH, http://rsbweb.nih.gov/ij/) as previously described (Veeraraghavan et al., 2015). Myocytes were isolated from LV-free wall of GP hearts using the enzymatic dispersion technique described previously (Wan et al., 2005). They were re-suspended in 10 ml of Dulbecco modified Eagle medium, stored at RT and used within 24 hr of isolation. Treatments were applied to myocytes 60 min prior to measurements. Patch clamping was performed in current clamp mode to record APs (Nassal et al., 2016). Briefly, cells were superfused in a chamber continuously perfused with Tyrode’s solution composed of (in mM) NaCl 137, KCl 5.4, CaCl2 2.0, MgSO4 1.0, Glucose 10, and HEPES 10, with pH adjusted to 7.35 with NaOH. Patch pipettes were pulled from borosilicate capillary glass and lightly fire-polished to 0.9–1.5 MΩ resistance when filled with electrode solution composed of (in mM) aspartic acid 120, KCl 20, NaCl 10, MgCl2 2, HEPES 5, pH 7.3. Myocytes were paced in current clamp mode with a 5 ms pulse at 1.5–2 times the diastolic threshold, at a cycle length of 1000 ms. The experiments were performed at 35°C. Command and data acquisition were operated with an Axopatch 200B patch clamp amplifier controlled by a personal computer using a Digidata 1200 acquisition board driven by pCLAMP 7.0 software (Axon Instruments, Foster City, CA). Na+ currents were recorded by ruptured-patch whole cell voltage clamp at RT (Hoshi et al., 2014). Microelectrodes were filled with a solution of (in mM) CsF 120, MgCl2 2, HEPES 10, EGTA 11 and brought to a pH of 7.3. Isolated myocytes were placed in the solution containing (in mM) NaCl 25, N-methyl D-glucamine 120, CsCl 5, MgCl2 1, NiCl2 1, glucose 10, HEPES 10, pH 7.3. INa was elicited from a holding potential of −80 mV with depolarizing voltage pulses from −60 mV to 45 mV for 500 ms. Current density (in pA/pF) was calculated from the ratio of current amplitude to cell capacitance. NRVM isolation procedures conformed to the UK Animal Scientific Procedures Act 1986. Ventricles were isolated from one-day-old rat pups anesthetized with a lethal dose of isoflurane, sectioned into small cubes, and processed using a combination of mechanical dissociation (gentleMACS) and enzymatic degradation (neonatal heart dissection kit; Miltenyi Biotec, Bergisch Gladbach, Germany). The resulting cell suspension was filtered and ventricular myocytes were plated onto glass-bottom dishes (MatTek Corp., Ashland, MA) in M199 supplemented with newborn calf serum (10%), vitamin B12, glutamate and penicillin/streptomycin (1%). Myocytes were allowed to grow and establish connections for 3–4 days in vitro. For viral transfection, cells were treated for 2–3 days in vitro with pLP-Adeno-X-CMV Cx43-EGFPN1 construct (advenovirus type V E1). Peptide treatments were applied to cell monolayers 60 min prior to INa measurements. SSCM combines scanning ion conductance microscopy (SICM) with confocal microscopy, with the laser being directed to the tip of the micropipette (Gorelik et al., 2002), to concurrently obtain a fluorescence image of the cell surface while capturing the topography of the exact same area. Briefly, a pair of NRVMs transduced with Cx43-EGFP was moved along the z axis while scanning along the x and y axes, using a three-axis piezo-translation stage. The cells’ surface was maintained at a constant distance from the nanopipette to enable non-contact capture of cell surface topography. A laser was passed up a high numerical aperture objective so that it was focused at the tip of the nanopipette, and a pinhole was positioned at the image plane, thus, placing the confocal volume just below the pipette. A variant of SICM, called hopping probe ion conductance microscopy, was combined with cell-attached recordings of cardiac sodium channels, as previously described (Bhargava et al., 2013), to assess INa at cell-to-cell contact sites from NRVM monolayers. Currents were recorded in cell-attached mode using an Axopatch 200A/B patch-clamp amplifier (Molecular Devices, Sunnyvale, CA), and digitized using a Digidata 1200B data acquisition system and pClamp 10 software (Axon Instruments; Molecular Devices, Sunnyvale, CA). Briefly, cell-to-cell junctional sites were identified using a sharp scanning nano-probe (40–50 MΩ), followed by controlled increase of pipette diameter (20–25 MΩ) for capture of active sodium channel clusters. The external solution contained (in mM): KCl 145, Glucose 10, HEPES 10, EGTA 2, MgCl2 1, and, CaCl21 (300 mOsm and pH 7.4), while the internal (pipette) solution contained (in mM) NaCl 135, TEA-Cl 20, CsCl 10, 4AP 10, Glucose 5.5, KCl 5.4, HEPES 5, MgCl2 1, CaCl2 1, NaH2PO4 0.4 and CdCl2 0.2 (pH 7.4). The voltage-clamp protocol consisted of sweeps to test potentials ranging from −70 to +30 mV from a holding potential of −120 mV. Whole-cell INa was recorded from NRVMs in low-sodium extracellular solution containing the following (in mM): CsCl 130, NaCl 11, Glucose 10, HEPES 10, MgCl2 2, CaCl2 0.5, CdCl2 0.3, adjusted to 7.4 with CsOH. The intracellular (pipette) solution contained (in mM): Cesium methanesulfonate (CsMeS) 100, CsCl 40, HEPES 10, EGTA 5, MgATP 5, MgCl2 0.75, adjusted to pH 7.3 with CsOH. Pipettes were pulled from the borosilicate glass microelectrodes and had a resistance of 3–4 MΩ. Sweeps were initiated from the holding potential of −100 mV to test potentials ranging from −75 to + 20 mV in 5 mV increments. Peak current was measured between −30 and −40 mV. Whole cell capacitance ranged between 9 and 16 pF. Current density (in pA/pF) was calculated as the ratio of the peak current to cell capacitance. A volume-conducted electrocardiogram (ECG) was collected from Langendorff-perfused GP ventricles, as previously described (Veeraraghavan et al., 2015; Veeraraghavan et al., 2016; Veeraraghavan and Poelzing, 2008), using silver chloride electrodes placed in the bath and digitized at 1 kHz. The incidence of ventricular tachycardias (VTs; defined as three or more consecutive, non-paced heartbeats with a cycle length shorter than 130 ms) was quantified; all VTs observed persisted for at least 1 min. Optical voltage mapping was performed using the voltage-sensitive dye, di-4-ANEPPS (15 µM; ThermoFisher Scientific, Grand Island, NY), as previously described (Veeraraghavan et al., 2015; Veeraraghavan et al., 2016; Veeraraghavan and Poelzing, 2008), in order to quantify longitudinal (CVL) and transverse (CVT) conduction velocities and anisotropy ratio (AR; the ratio of CVL to CVT). During these experiments, motion was reduced using 7.5 mM 2,3-butanedione monoxime and by mechanically stabilizing the anterior epicardium against the front wall of the perfusion chamber. Ventricles were paced from a midapicobasal site on the anterior LV epicardium at basic cycle lengths of 160, 200 and 300 ms with 1 ms current pulses at 1.5 times the pacing threshold as described previously (Veeraraghavan and Poelzing, 2008). Preparations were excited by 510 nm light (generated from a 150 W halogen light source, passed through a 510/10 excitation filter) and fluorescent signals passed through a 610 nm longpass filter (Newport, Irvine, CA) and recorded at 1000 frames/s using a MiCAM Ultima-L CMOS camera (SciMedia, Costa Mesa, CA). Activation time was defined as the time of the maximum first derivative of the AP (Girouard et al., 1996a) and activation times were fitted to a parabolic surface (Bayly et al., 1998). Gradient vectors evaluated along this surface were averaged along the fast and slow axes of propagation (±15°) to quantify CVL and CVT, respectively (Girouard et al., 1996b). Human-induced pluripotent stem-cell-derived ventricular cardiomyocytes (iPSC-CMs, Axol Biosciences, Cambridgeshire, UK) were plated on fibronectin-coated glass-bottomed chamber slides and maintained as monolayers for eight days at 37°C, 5% CO2 in a humidified atmosphere in Cardiomyocyte Maintenance Medium (Axol Biosciences, Cambridgeshire, UK). Cells were loaded with the fluorescent calcium indicator Fluo-4AM in Hanks balanced salts solution using the Fluo-4 calcium imaging kit according to manufacturer’s instructions (ThermoFisher Scientific, Waltham, MA). After 15 min equilibration in the microscope stage incubator (Okolab, Burlingame, CA) 20X image sequences were acquired at a rate of 400 fps on an Opterra swept-field confocal microscope (Bruker, Middleton, WI) equipped with a 510–520 nm emission filter, an Evolve Delta 512 × 512 EMCCD digital monochrome detector (Photometrics, Tucson, AZ), and a Helios 488 nm solid state laser source (Coherent, Santa Clara, CA). In order to develop a selective modulator of β1-mediated adhesion, we adopted a strategy previously applied to N-cad (Williams et al., 2000b; Williams et al., 2002), and desmoglein-2 (Schlipp et al., 2014), wherein peptide mimetics of adhesion domains were employed as inhibitors. Thus, we identified the putative β1 adhesion domain by comparing the ectodomains of βadp1 and desmoglein-2, and developed a peptide mimetic, βadp1 (FVKILRYENEVLQLEEDERF). Additionally, we developed a scrambled control peptide, βadp1-scr (EVEQRDILEFYLLEFNVRKE), as a negative control, and a βadp1-R85D (FVKILRYENEVLQLEEDEDF), a variant peptide incorporating a substitution of the positively charged arginine at position 19 of βadp1 with a negatively charged aspartic acid. For all experiments, 20 mM stock solutions of peptides in DMSO were used. All data are presented as mean ± standard error unless otherwise noted, and statistical analyses were performed as previously detailed (Veeraraghavan et al., 2015; Veeraraghavan et al., 2016; Veeraraghavan and Gourdie, 2016). Briefly, single factor ANOVA, two factor ANOVA, or two-tailed Student’s t-test with Šidák correction was applied, as appropriate, to parametric data, while Fisher’s exact test was applied to non-parametric data. A p<0.05 was considered statistically significant. In order to facilitate investigation of NaV1.5 and β1 to ID nanodomains, we developed novel, high affinity rabbit polyclonal antibodies against C-terminal epitopes on Nav1.5 and β1. Both antibodies showed strong immunofluorescent signal (green) enriched at the IDs with low background in confocal images of immunolabeled transmural sections of GP ventricular myocardium (Figure 1—figure supplement 1A, (B). This immunofluorescent signal was abolished in the presence of peptides corresponding to the respective epitopes. In western immunoblots of whole cell lysates of GP ventricular myocardium run on prep gels, labeled with NaV1.5 and β1 antibodies, bands were observed at 250 and 37 kDa, respectively (Figure 1—figure supplement 1C,D left lanes), which correspond to the molecular weights of the two proteins. Again, these signals were abolished in the presence of peptides corresponding to the respective epitopes (Figure 1—figure supplement 1C,D right lanes). These results demonstrate the specificity of our novel Nav1.5 and β1 antibodies. Additionally, in western immunoblotting experiments, bands corresponding to β1 at 37 kDa were noted in whole cell lysates from 1610 β1OX cells and membrane lysates from the brains of WT mice, but not in whole cell lysates from 1610 Parental cells or membrane lysates from the brains of β1-null mice (Figure 1—figure supplement 1E,F). In dot blot experiments, our NaV1.5 and β1 antibodies demonstrated selective affinity for their respective antigen peptides without cross-reactivity to each other’s antigen peptides (Figure 1—figure supplement 2). In order to determine whether tight junctions might contribute to cell-to-cell adhesion in 1610 cells, we used confocal microscopy to assess levels of tight junction proteins: Levels of ZO-1, claudin, and occludin in 1610 cells were low or undetectable (data not shown), indicating that cell-to-cell adhesion in 1610 cells was not dependent on tight junctions. Additionally, junctional resistance in 1610β1OX cells was not significantly affected by a 50% decrease (to 0.625 mM) in extracellular Ca2+ (109.7% of control, n = 5, p=ns), an intervention that disrupts adhesion mediated by cadherins (Vite and Radice, 2014), but not by β1, as reported by others (Isom, 2002). IEEE Transactions on Biomedical Engineering 45:563–571. The Journal of Neuroscience 21:RC173. Handbook of Experimental Pharmacology 221:51–89. The Journal of Physiology 402:751–771. The Journal of Physiology 593:1347–1360. In: G. C. K Roberts, editors. Encyclopedia of Biophysics. Berlin Heidelberg: Springer. pp. 2336–2337. British Journal of Pharmacology 163:469–483. Journal of Cardiovascular Electrophysiology 7:1024–1038. Circulation: Arrhythmia and Electrophysiology 10:e004400. The Journal of Physiology 596:563–589. 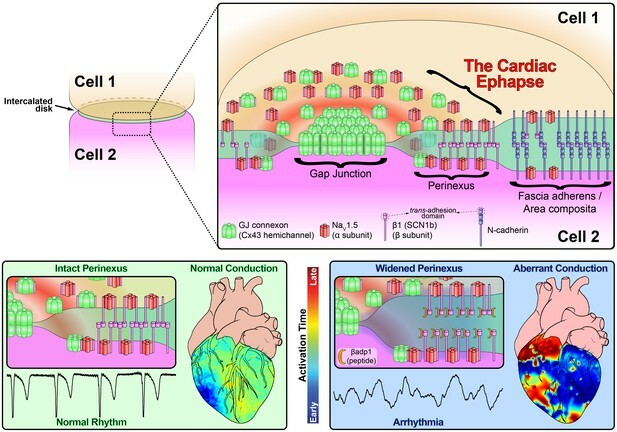 Nav channel complex heterogeneity: new targets for the treatment of arrhythmia? Journal of Biological Chemistry 270:3306–3312. IEEE Transactions on Biomedical Engineering 60:576–582. Journal of Molecular and Cellular Cardiology 43:636–647. Journal of Biological Chemistry 275:11383–11388. Journal of Ultrastructure Research 37:592–600. American Journal of Physiology-Lung Cellular and Molecular Physiology 278:L888–L898. Journal of Biological Chemistry 289:10797–10811. Annual Review of Physiology 77:481–504. Biochimica Et Biophysica Acta (BBA) - Biomembranes 1818:1831–1843. American Journal of Physiology-Heart and Circulatory Physiology 292:H3043–H3051. Molecular Biology of the Cell 22:1516–1528. The Journal of Membrane Biology 245:411–422. Journal of Ultrastructure Research 67:79–88. Molecular Biology of the Cell 27:3583–3590. Pflügers Archiv - European Journal of Physiology 467:2093–2105. Pflügers Archiv - European Journal of Physiology 468:1651–1661. Cell Communication & Adhesion 21:169–179. Neuroscience and Behavioral Physiology 30:575–585. Journal of Molecular and Cellular Cardiology 39:419–428. Circulation: Arrhythmia and Electrophysiology 2:268–275. Journal of Biological Chemistry 275:4007–4012. Molecular and Cellular Neuroscience 15:456–464. Journal of Biological Chemistry 277:4361–4367. Annals of the New York Academy of Sciences 1101:72–84. Thank you for submitting your article "The Adhesion Function of the Sodium Channel Beta Subunit (β1) is Required for Cardiac Action Potential Propagation" for consideration by eLife. Your article has been reviewed by two peer reviewers, and the evaluation has been overseen by a Reviewing Editor and Richard Aldrich as the Senior Editor. The following individual involved in review of your submission has agreed to reveal her identity: Colleen Clancy (Reviewer #1). The manuscript entitled, "The Adhesion Function of the Sodium Channel Beta Subunit (β1) is Required for Cardiac Action Potential Propagation" describes combined experimental and computational studies on cardiac myocyte cell adhesion medicated by β1 protein (SCN5A), interacting with transmembrane voltage gated ion channel NaV1.5. β1 provides a scaffold for concentrating NaV1.5 in the perinexal cleft adjacent to gap junctions (GJ). It generates close cell-cell apposition within intercalated disks. 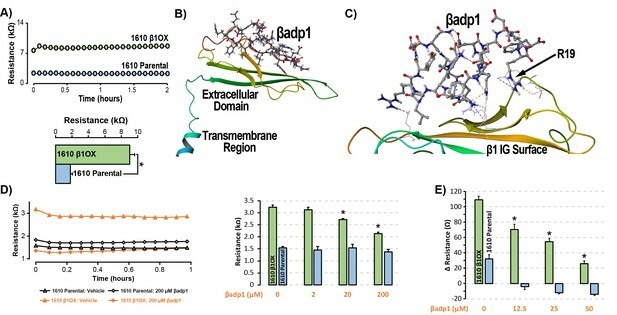 A rationally designed peptide βadp1 inhibits β1 adhesion. Multiple spectroscopic, electrophysiological and modeling experiments performed by the authors provided details of this process and also its consequences for sodium channel and overall electric cardiac myocyte and tissue activities including an increased incidence of arrhythmias. 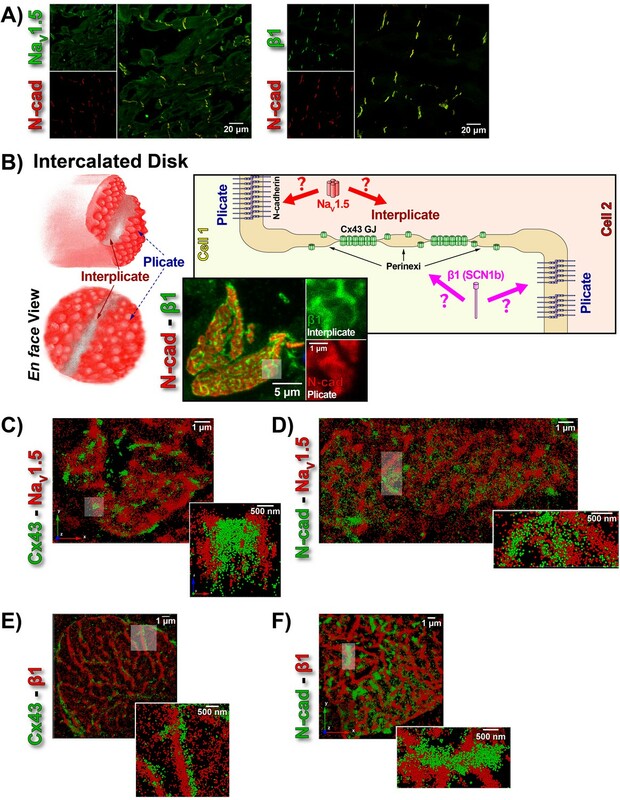 The authors suggest that their findings indicate plausibility of ephatic conduction mechanism in cardiac tissue, which operates via transient changes in ion concentration in a narrow extracellular cleft rather than connexin mediated GJ connections. And extracellular β1 domain adhesion may play a major role in this mechanism, which becomes disrupted e.g. by βadp1 peptide. The authors suggest that understanding this mechanism may lead to novel ways of β1 mutation associated arrhythmias. This is a very interesting study, which might be of substantial significance since it suggests major re-evaluation of fundamental electrical signal propagation mechanisms in the heart tissue. There are, however, a few shortcomings, which need to be addressed before the manuscript can be published. There are certain aspects of the results that are unconvincing and/or confusing. That is to some extent inevitable given the range of techniques employed. However, in order to really make the manuscript both convincing and understandable to most readers, the authors need to improve some of the analysis of data and/or how it's described. And some of the less convincing results, in particular those in Figure 4E-F, might be better off left on the cutting room floor. Unless I misinterpreted something, these results seem to add nothing to the story. 1) First of all, it would be helpful to more clearly state the general overarching idea in the Introduction and again in the beginning of the Results section. A cartoon representation of the system/problem at hand similar to Figure 8 will be extremely useful. 2) The authors interpret results of their studies in favor of ephatic mechanisms, but it seems that it has not been confirmed directly, only through mathematical modeling and interpretation of the experiments, which suggest plausibility, but cannot prove. This should be clearly stated and some description of alternative explanations as well as possible shortcomings and alternative explanations might need to be mentioned. 3) A concise methodology section at the end of main text be very helpful. 4) Subsection “STORM-RLA Indicates NaV1.5 Distributes Between Two Pools within the Intercalated Disk” – connection between Figure 2 and some values described in the text needs to be made more clear. For instance: "over half of these β1 clusters localized to the perinexus" Where is it shown in Figure 2? 5) How was β1 and βadp1 docking performed? "stabilization of the interaction via a network of intramolecular hydrogen bonds" – this does not make sense since intramolecular H bonds would typically stabilize a particular protein conformation but intermolecular H bonds would stabilize peptide – peptide interaction. How stabilities of the docked complexes were estimated? 6) "physical extent of the β1 extracellular domain […] 7-15 nm, depending on relaxation state of the domain" – that length is indeed very subjective especially considering absence of structural information in this region, necessary for accurate homology modeling. 7) Figure 2E is confusing. It is not clear why dark shading for any overlap is combined with% of clusters located in perinexus (light shading). In this case how do the clear bars can represent "no overlap" case? 8) Figure 3 parts are not clear/confusing. Panel B. There is a long completely disordered terminal fragment. Most likely, there was no homologous template structure in β3, and it was modeled de novo. It should not have been included in the homology modeling. Docked βadp1 – β1 structure is not clear as shown. A representation with two differently colored molecular surfaces and/or ribbons with a few interacting residues shown in atomic details would be much more useful. 9) Resistances in panels A and D are very different numerically. Also, there are differences in numbers in the line plots and summary bar graph in panel D. For 200 μm βadp1 values on the left graph are bigger for parental but the other way around on the right graph. 10) Figure 4F – what is the significance of low Ca2+ results? They do not seem to be described in the text. 11) In the Introduction in the first paragraph, it is stated that "[…] electrical excitation jumping between myocytes across extracellular clefts, not wholly unlike how activation steps discontinuously between neurons at the synaptic cleft." I'm not sure what they're trying to imply here – seems to me that ephaptic coupling is wholly unlike standard synaptic communication between neurons (which involves neurotransmitters and all). 12) In the Discussion it's stated that "Ephaptic coupling is known to operate in neural and other tissue". I think that ephaptic coupling is only significant in a setting when there is a high degree of synchrony and "neural mass" effects are present. 13) Except in special cases (e.g., PHP – Mauthner cell synapses), cell-cell ephaptic coupling is very weak… perhaps you could describe the typical strength of ephaptic coupling in neural tissue and its (potential) functional role. 14) In the Discussion, there's a paragraph or two of evolutionary speculation. While (or whilst!) I personally like evolutionary speculation in general, here it's probably a bit too speculative, and it really doesn't add much to the paper in my opinion. I'm actually not sure if cells in invertebrate hearts were shown to be lacking all direct electrical coupling (it would have been nice to have a citation there), but invertebrates do have gap junction proteins (inexins), and invertebrate hearts are typically neurally driven. 15) The results with the fluorescent dyes shown in Figure 4 are extremely unconvincing. First, with the 0.3 kDa dye, why the fluorescence in the ID initially higher than in the interstitial space? Wouldn't this most likely occur not because of diffusion, but because some binding partner is trapping the dye in the ID? Maybe I'm wrong, but that seems like the most likely explanation to me. Thus, when the peptide alters this, does it cause a change in the diffusion, or does it just disrupt the "trapping"? Although something is clearly happening with the 0.3 kDa dye, it seems premature to ascribe this effect to diffusion. In general, diffusion is best assessed using dynamic time course techniques such as FRAP. With the snapshots presented, it's difficult to make strong inferences. The other issue here is that the peptide causes no change at all to the distributions of the 3kDa and 10kDa dyes. However, low [Ca] does, although this result is shown in the figure yet not described at all in the text. Overall these results are confusing and difficult to interpret, and the authors' conclusions about diffusion barriers is not compelling. 16) The results shown in Figure 3, with a technology called ECIS, show convincing trends, but what exactly is being measured in these experiments is not at all clear. What's confusing is that the text refers to measurements of "intercellular junctional resistance." Does this mean resistance through the gap junctions connecting adjacent cells? In the context of cardiac electrophysiology, that's what this term usually means. But the trends seen in the Results seem to indicate that something different is being measured, which makes this part confusing. For instance, I one would expect the gap junctional resistance to be much lower in the 1610 β10X cells than in the 1610 parental cells. And then I would expect the peptide to increase this resistance in the β10X cells. But instead the exact opposite trends are observed. So, what is the ECIS technique actually measuring? It must be some form of impedance from one electrode to another electrode in the extracellular space? But can this resistance be directly related to the cable properties that help to determine conduction? This section requires much clearer explanations of what is being measured and what the results mean in terms of physiological parameters. 17) It is convincing in Figure 7 that the peptide widens the QRS complex and slows propagation. But why should this be anisotropic? If the IDs are located at the cell ends, disruption of these ephapses would be expected to slow both longitudinal and transverse condition, with no a priori reason to think there should be a change in the anisotropy ratio. The manuscript repeatedly mentions the 2015 Pflugers Archiv paper for justification for this, but without offering any explanation. Readers of the journal shouldn't have to also examine prior studies in order to understand these results. 18) The results in Figure 6 are interesting, but the interpretation is not totally clear. If the peptide was just increasing the width of the ID between myocytes, this would affect the ephaptic conduction, without necessarily decreasing the amount of Na current at the ephapse. So it seem like the β subunit is also keeping the channels in that location, besides controlling the width of the gap. 19) The colocalization analyses shown in Figure 2 are quite confusing and not well-described. The text requires the reader to slog through lots and lots of numbers, without a good sense of the big picture implications. And when one examines the figure, it's not at all clear how "incidence of overlap" in Figure 2E should be different from "degree of overlap" in Figure 2F. The difference between these measured is only mentioned in passing. Sometimes 2E and 2F are consistent with each other, other times not. This is all quite confusing. […] There are certain aspects of the results that are unconvincing and/or confusing. That is to some extent inevitable given the range of techniques employed. However, in order to really make the manuscript both convincing and understandable to most readers, the authors need to improve some of the analysis of data and/or how it's described. And some of the less convincing results, in particular those in Figure 4E-F, might be better off left on the cutting room floor. Unless I misinterpreted something, these results seem to add nothing to the story. We thank the editor, and reviewers for their thoughtful evaluation of our study, and have significantly revised the manuscript in response. Foremost, we appreciate the key issues identified by the reviewers which cofound interpretation of our dye perfusion studies. Given that these results are not essential to our primary conclusions, we have removed the dye perfusion experiments from the manuscript. Additionally, we have significantly revised Figure 2, and the text describing the STORM results with the goal of making them easier to comprehend. We thank the reviewer for this helpful suggestion and have revised the closing paragraph of the Introduction, and added an opening paragraph to the Results section outlining the overarching ideas tested in our study. Likewise, we have revised Figure 1B, adding a cartoon illustrating the problem at hand. The reviewer’s point is well-taken. We have added text to the last paragraph of the Discussion softening claims regarding ephaptic coupling. We have added a brief account of the methods to the paper with a fuller description included in the supplement. We have now revised Figure 2, and significantly rewritten the section describing the STORM results (subsection “STORM-RLA Indicates NaV1.5 Distributes Between Two Pools within the Intercalated Disk”), with the aim of making it simpler, and clearer. We hope that these revisions adequately clarify the inferences drawn from this complex dataset. We have rewritten the section on molecular modeling noting the software used, and reworded the binding description – intramolecular bonds stabilize the binding pose, which lowers binding energy. Electrostatic/hydrophobic interactions are peptide-protein. This has now been clarified in the manuscript and we have added the free energy of binding from MMGBSA refinement of poses to the text. 6) "physical extent of the β1 extracellular domain[…] 7-15 nm, depending on relaxation state of the domain" – that length is indeed very subjective especially considering absence of structural information in this region, necessary for accurate homology modeling. Structural information from the β3 crystal structure approximate the size of that extracellular loop to be ~5nm (DOI: 10.1098/rsob.140192, Figure 3), and β1 is slightly larger. A homology model based on a 4.0 Å cryo-EM of the NaV1.4-β1 complex from the electric eel (Figure 3B) shows that there is a relatively unorganized region linking the Ig loop and the transmembrane domain, fully capable of extending the length between the membrane and the furthest regions of the protein by a few nm. These results support the possibility that two apposed β1 subunits can span a 10-15 nm extracellular cleft. We have added this improved visualization of our β1 molecular model to Figure 3B, and revised the text (subsection “βadp1 – A Rationally Designed Inhibitor of β1-mediated Adhesion”, second paragraph) to better clarify the modeling approach as noted above. We appreciate the reviewers pointing out this confusing labeling in this figure, and have now revised it. In Figure 2A (previously 2E), each bar is now divided into 3 segments: overlap (colored), adjacent (perinexal) (shaded), distant (clear). We hope that this resolves the issues stemming from our formerly confusing labeling. We thank the reviewer for these very helpful suggestions. The docking studies referenced in the text were performed with an updated homology model that incorporated structural data from a 4.0 Å cryo-EM of the NaV1.4 channel in complex with β1. The binding surface depicted was unchanged upon updating the model, but Figure 3B now more accurately reflects the structure between the IG loop and the transmembrane domain. The updated view in Figure 3C removes the surface rendering of the β1 Ig loop and shows atomic details of βadp1 binding (ball and stick) and β1 surface (cartoon with interacting residues as stick). The initial experiments comparing 1610β1WT and 1610 Parental cells were carried out with 4 x 104 cells seeded per well, whereas the experiments with βadp1 were conducted with 1 x 104 cells per well. Hence, the difference in the absolute values measured. Additionally, the line graphs (Figure 3D, left) present representative results from a single ECIS experiment whereas the bar graph (Figure 3D, right) presents summary data from 5 experiments, each with 2 technical replicates per cell type and treatment condition. These details are now better clarified in the figure legend. Based on the reviewers’ feedback, we have removed the dye perfusion studies from the manuscript. This sentence was meant to draw a distinction between GJ coupling, which occurs via cytoplasmic continuity, and synaptic and ephaptic mechanisms, both of which work across narrow extracellular clefts, albeit in different ways. In order to avoid confusion, we have removed this sentence from the manuscript. 13) Except in special cases (e.g., PHP – Mauthner cell synapses), cell-cell ephaptic coupling is very weak. Perhaps you could describe the typical strength of ephaptic coupling in neural tissue and its (potential) functional role. We agree with the reviewer on the relative role of ephaptic coupling in neural tissues, vis-à-vis other coupling mechanisms. We were simply making the point that prior experimental observations of ephaptic coupling had been made in neural and retinal tissues, unlike the case with the heart. To make this clearer, we have softened the wording of this statement in the second paragraph of the Discussion. We agree with the reviewer that this discussion distracts from the main points of the manuscript; therefore, we have removed this section. We thank the reviewer for pointing out some key issues that cofound interpretation of our dye perfusion studies. Given that these results are not essential to our primary conclusions, we have removed the dye perfusion experiments from the manuscript. 16) The results shown in Figure 3, with a technology called ECIS, show convincing trends, but what exactly is being measured in these experiments is not at all clear. What's confusing is that the text refers to measurements of "intercellular junctional resistance." Does this mean resistance through the gap junctions connecting adjacent cells? […] This section requires much clearer explanations of what is being measured and what the results mean in terms of physiological parameters. The ECIS technique does indeed rely on measurement of impedance between electrodes placed across a monolayer of cells. Specifically, this technique measures the electrical impedance offered by a monolayer of cells to current flow between electrodes located above, and below the monolayer, and previous studies demonstrate that the resistance of the extracellular cleft at cell-cell junctions (junctional resistance) is well-reflected by measurements at low frequencies (62.5-4000 Hz) (Williams, Williams and Doherty, 2002; Schlipp et al., 2014). This is now clearly stated in the manuscript (subsection “βadp1 – A Rationally Designed Inhibitor of β1-mediated Adhesion”, first paragraph). Since the technique measures impedance between two extracellular compartments (above, and below the cells), it is incapable of assessing gap junction resistance connecting the intracellular compartments of adjacent cells. We thank the reviewer for raising this excellent question. We reason that the anisotropic effects of βadp1 treatment reflect the fact that a wavefront traveling transverse to the fiber axis would encounter more cell-cell junctions per unit distance than one traveling longitudinally. Thus, any compromise in cell-cell coupling via perinexal nanodomains would have a greater impact on transverse conduction, than on longitudinal conduction. We have now added this explanation to the sixth paragraph of the Discussion. We do indeed agree with the reviewer on this point. The β1 subunit likely performs multiple functions in the generation, and maintenance of ephaptic nanodomains. We have now revised Figure 2 and significantly rewritten the section describing the STORM results (subsection “STORM-RLA Indicates NaV1.5 Distributes Between Two Pools within the Intercalated Disk”), with the aim of making it simpler, and clearer. Briefly, ‘Incidence of overlap’ referred to the percentage of clusters which demonstrated any overlap at all, while ‘degree of overlap’ referred to the fractional volume of participating clusters involved in the overlap. To avoid potential confusion, we have now relabeled the incidence of overlap as “relative localization overview” and noted that the solid, shaded, and uncolored bars refer respectively to “any overlap”, “adjacent”, and “distant” situations. We hope that these revisions to the figure, and the text have mitigated the issues noted by the reviewer. The study was supported by National Institutes of Health R01 grants awarded to RGG (RO1 HL56728-15A2; RO1 HL HL141855-01), SP (R01 HL102298-01A1; RO1 HL HL141855-01), LLI (R37NS076752), and JWS (R01 HL132236-02) and an American Heart Association Scientist Development Grant awarded to RV (16SDG29870007).